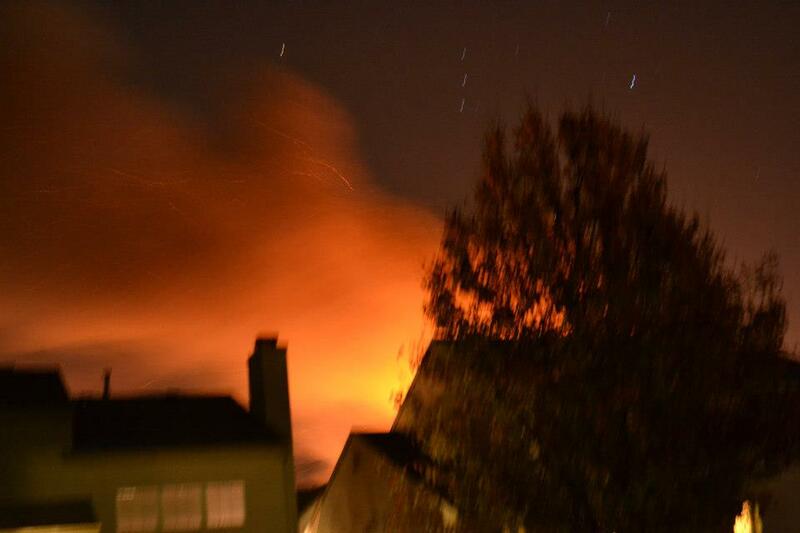 November 10th marks the one year anniversary of the Richmond Hill explosion. As I reflect on the past year and all that has transpired since that night – I am overwhelmed with emotions. Like many of my Richmond Hill friends, I have felt the heavy burden of sadness, anger and frustration. I have even felt guilt as as our neighbors houses were torn down and ours was left standing. But throughout this past 12 months, I’ve also experienced tremendous hope, unmatched generosity and a sense of community like none other. The outpouring of support from family, friends and colleagues is testament to the goodness that exists. I am grateful to all those who prayed, who donated, who offered words of encouragement. Our journey is far from over, the wounds of some may never fully heal. 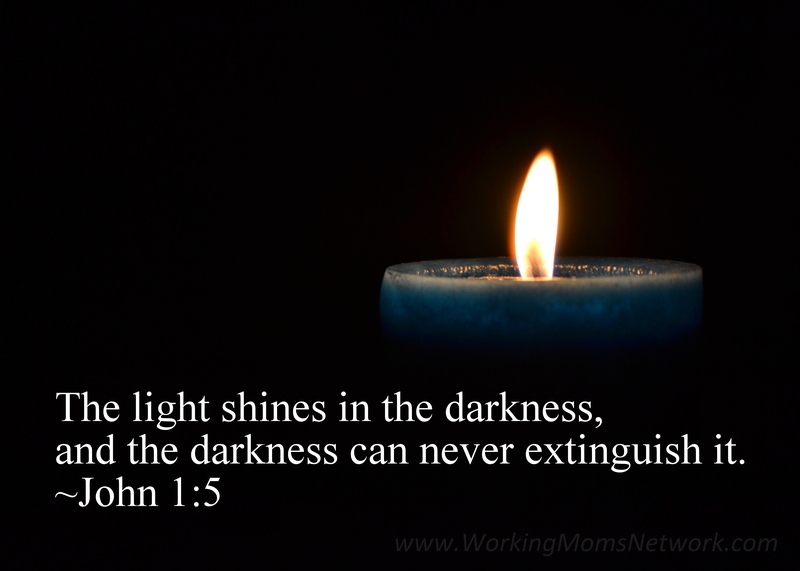 There are still many challenges that lie ahead but Richmond Hill is stronger and our light will continue to shine! As many of you may know, we had to move out of our house for two months while our house repairs were being completed. Well, we moved back into our house at the end of March and we are thrilled. Now that we have had time to get settled in, we decided to have a house blessing and open house to welcome all of our friends, family and neighbors to celebrate with us and to thank them all for praying and supporting us through this trying time. Of course, I love any excuse to plan a party and since we were in the apartment for the twins’ birthday, this was a great opportunity for me. 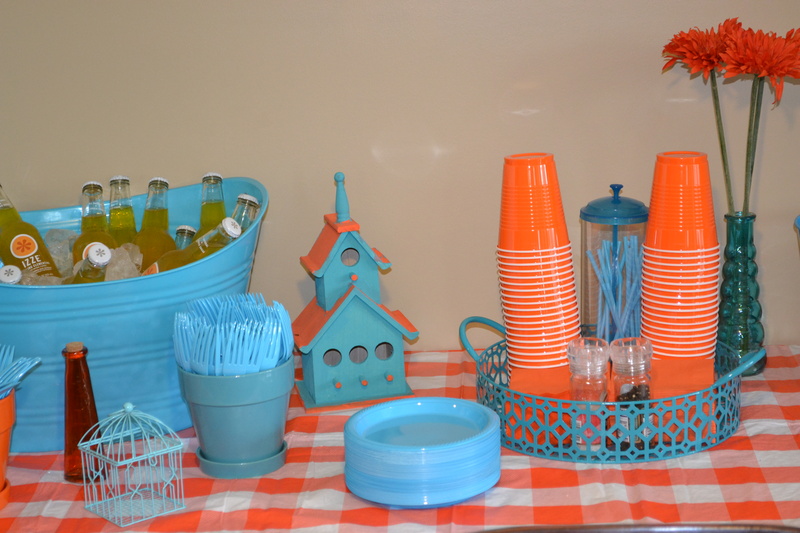 I wanted to do a “Bless Our Nest” theme and I’ve been obsessing over orange and teal so I went to work on Pinterest pinning all my ideas. My talented sister designed my custom invites which turned out absolutely perfect and I was able to get all my decorations and such in just a few stores. I was so very happy with how everything turned out and it was absolutely wonderful to be surrounded with some of our closest friends for such a special day. Monsignor Mark said a wonderful blessing and then went into each room to bless them individually. He even joked with Noah a bit when he asked him if he had made his bed before going in to bless it. Thanks so much to everyone again who could attend and also to those who prayed with us. God has blessed us abundantly with such a strong faith family. We Love you all. I’m usually a Glass Half Full kind of girl, an eternal optimist you might say…That being said, the last few months have been sprinkled with many trials for my family. While I’m sure I did not handle them all with grace, I try to remind myself that God often sends us trials so that we may better understand our blessings. As you may already know, our home is in the Richmond Hill neighborhood that endured a massive home explosion on November 10, that killed two people and damaged or destroyed over 100 homes. We were fortunate that our house was (minimally?) damaged. Other than the 2 nights immediately following the explosion, we had been living there pretty normally…Blessing #1. On January 8, we met with our restoration contractor and the plan was to move out and get started our home repairs right away… as in the next week. Aaahhhhh! How was I supposed to pack up my stuff, move into a hotel and make all these house decisions in that short of time, all while working a full time job, juggling kids’ activities and all the other demands of life? I called my mom, in a panic for advice. She and my dad live in New Orleans but they had just been visiting us for a late Christmas and had only left 4 days prior…so I absolutely was astounded when she booked a flight back to Indy the very next day to help us out. Blessing #2 was absolutely the biggest blessing of this whole ordeal! My mom has such a great knowledge of construction and she is a whiz at packing and organizing. I honestly could not have done it without her. Now the original estimate indicated that we would be out of the house for 2 weeks and the insurance company was going to set us up in two hotel rooms during that time. My gut instinct told me it was going to be much longer than 2 weeks and let’s face it, no one wants to be stuck in a hotel room for that long unless your on vacation. I spent the next 2 days searching for a more suitable housing arrangement and was just about to give up when Blessing #3 came from my co-worker. She saw my anxiety and searched diligently to find a nice 3 bedroom apartment in Greenwood that had 3 weeks left on a lease. Through many emails, phone calls and the application process we were able to secure the apartment for move in on the 15th. My contractor even offered his crew to help us move our own furniture & belongings into the apartment…Blessing #4. So we got busy packing and moved in pretty easily and the rest of that week the moving crew continued to pack up and store all the rest of our belongings. The real work was to begin then on the 21st then. Well, long story short, it’s now March and we are still in the apartment but we can see the finish line. We are hoping to be back in the house in less than a week now so check back soon and I’ll update you on the rest of our blessings through this journey. As you encounter the trials of life, I encourage you to listen to the words of Laura Story’s song Blessings and try to find your blessings in disguise. Those words from this song, began an evening of healing and community for myself, my family and my neighbors. As many in Indianapolis and around the world know, on November 10, 2012 a deadly explosion rocked our lives and took the lives of two young people Jennifer and Dion Longworth. Over 80 houses were affected and 30 of those were so severly damaged they had to be torn down. Families have been displaced, people are on edge and frightened, but on this evening, December 22 we took our candles and we lit our world. Over 1000 bags and candles were assembled and distributed by members of the Richmond Hill neighborhood during the day. Everyone pitched in, it was really great. Folding bags till they piled up to the ceiling and filled the garage; pouring sand and placing a tea light in each bag. The kids enjoyed it too. Even my eight year old son, felt like he was part of something big, as he hopped in the back of the truck to start placing the bags along the streets. It was a lovely evening. It started at the house of one family who setup a hot cocoa & cookies stand to bear the freezing temps. There was a moment of silence as we lit two candles filled with dirt from the property of those two young lives lost. People walked and talked, they laughed and cried. It was beautiful. When did “Disagree” become synonymous with “Hate”? Something has been weighing on my mind for several weeks now and I realized that I may not be the only one who feels this way, so I thought I would write about it. 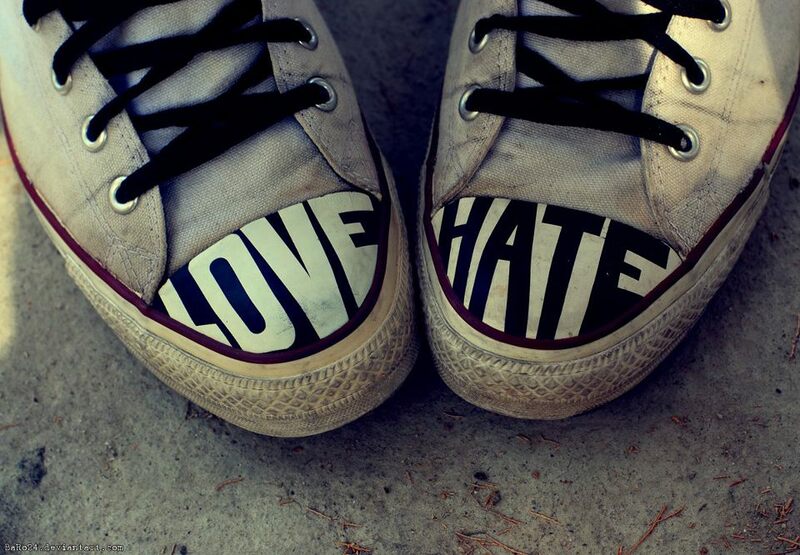 It seems of late, that everything I read in the news and in social media talks about “hatred” when someone is in disagreement with them about a topic, action or behavior. I don’t understand this at all. I grew up (and still am) a fairly conservative individual—someone who chooses to “follow the rules” to the best of my abilities. Ask the people I went to high school with—when most of my classmates were out partying, I was the nerd who never drank or smoked or did anything “crazy” like that. That being said, I have generally been pretty open-minded. It’s not my job to judge others, just as I would hope that others don’t judge me. The media storm and hatred that has propagated recently over differences in opinion is really disheartening. Whether you believe in universal health care or not, whether you believe that marriage is between a man and woman or not—if my opinion differs from yours does that mean that I am a hater, a bigot or evil? The fact is that everyone has free will in their opinion about what is “right” or “wrong” according to their own internal morality. And we all have the right to behave in a way that aligns with our belief systems. Yet when the CEO of Chick-fil-A, Dan Cathy expresses his beliefs regarding the biblical definition of marriage, the news and social media are flooded with hateful messages. Likewise, businesses showing support for the gay community get equally hateful messages boycotting their brands. The fact is that God loves all of us—we all are sinners and yet He loves us. My personal belief is that the Bible gives us a pretty clear picture of how to behave in the 10 commandments. Does that mean that when my daughter disobeys me or my son hits his little brother, that I shouldn’t express my belief of why that is wrong? If I tell my kids that it’s not okay to take a candy bar from the grocery store without paying, will I be subject to hateful messages? I’m sure many will disagree with my statements and quite frankly I’m okay with that. My hope, of course, is that if you choose to comment that your comment is free of hateful intent. 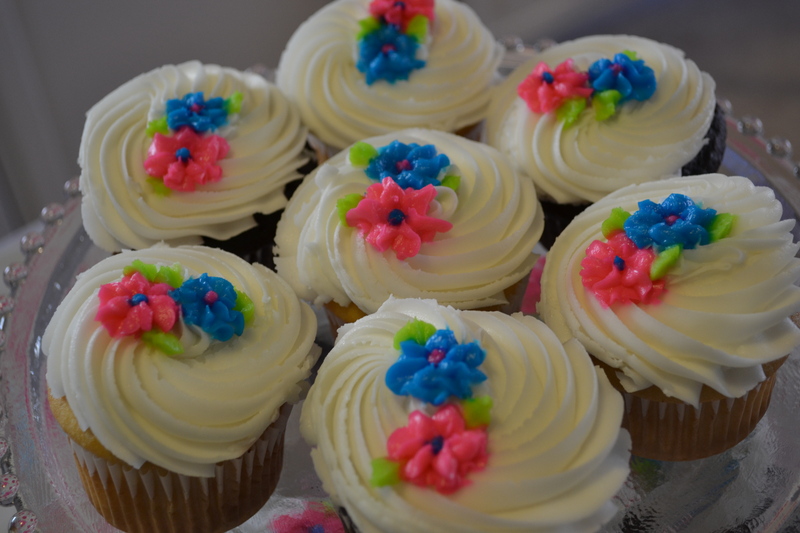 My Twins recently celebrated their 8th birthday and I held an overlapping party. 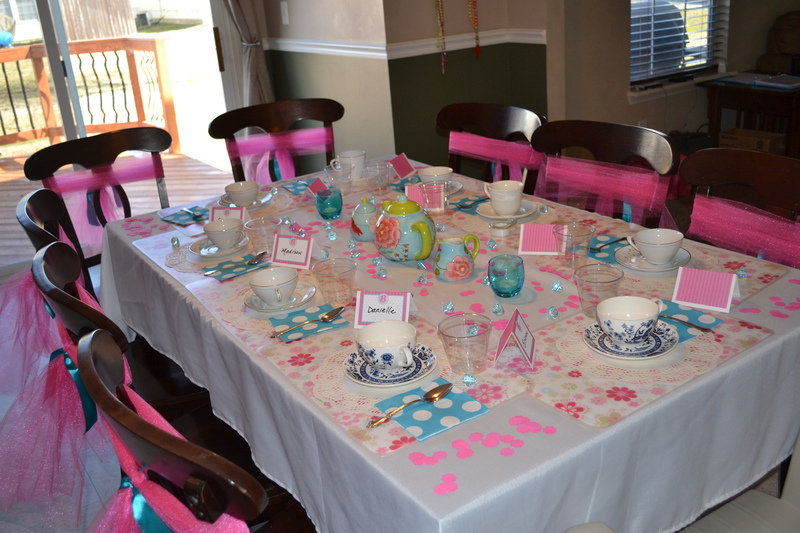 I had so much fun planning Brianna’s Tea Party Birthday that I wanted to share it with all of you. Although, I enjoy planning parties in general, this one was really enjoyable and I was so pleased with how everything turned out. 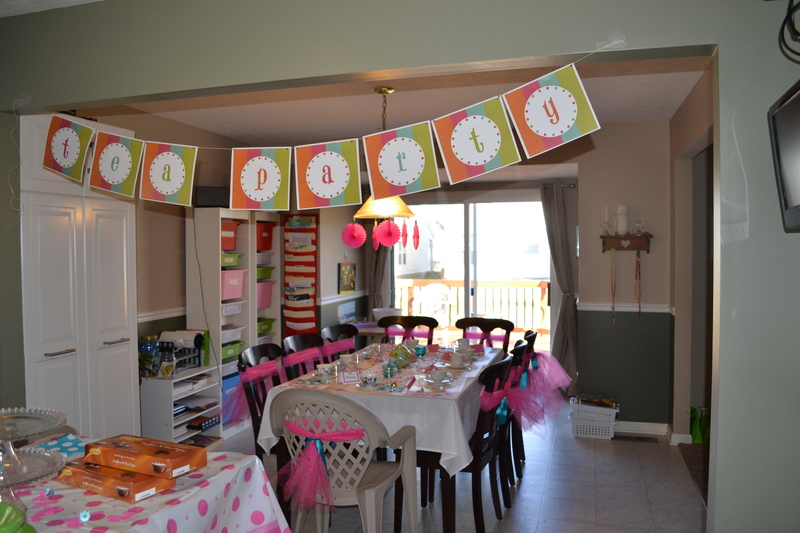 I did a ton of searching on Pinterest to find my ideas and found some beautifully designed parties. You can take a look at my “Holiday and Parties” board to see some of my inspiration. We decided on a “Dolly and Me Tea Party” which was great because Brianna just got her first American Girl Doll from Santa for Christmas this year and many of her friends have them as well. The first thing I did was to have my wonderfully talented sister over at FookaDesigns.com design the invitation and matching place cards which both turned out absolutely adorable. From her design I decided to focus the color scheme on hot pink and teal with a polka dot influence. To decorate, I purchased an inexpensive white table cloth, some adorable plastic placemats along with a super-cute Tea Pot set with sugar and creamer that I found at The Christmas Tree Shops. We also purchase some hot pink tulle at Joann’s to wrap around the chair backs and tied each with a teal ribbon to match the color scheme. 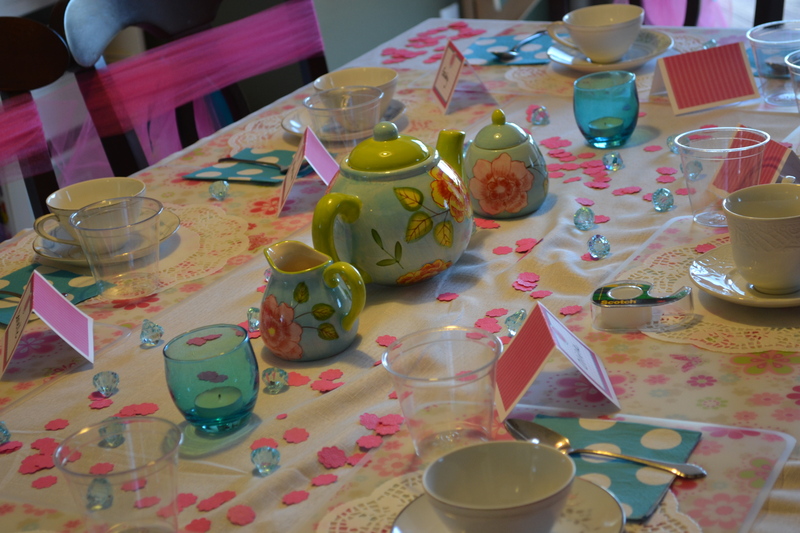 We dressed the table with some teal colored “jewels” and some pink flower confetti (just in case it wasn’t girly enough). Finally, we placed the teacup & saucer on top of a doily at each placemat. 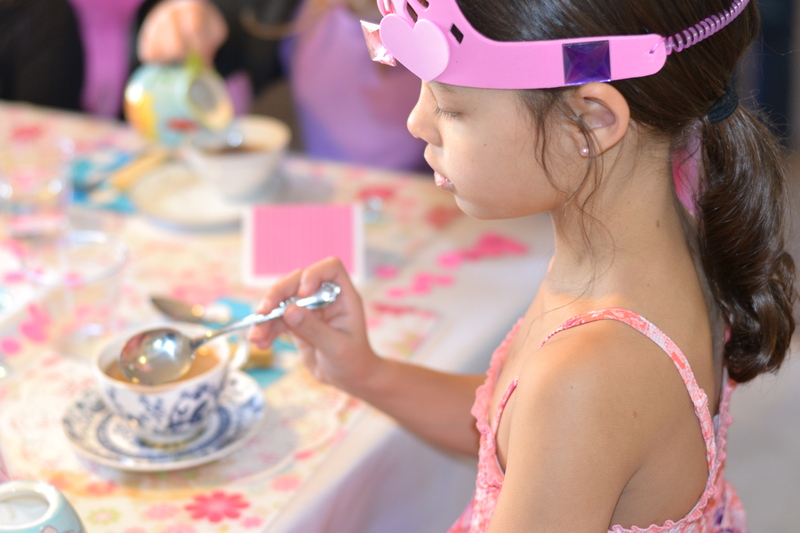 I found 9 sets of teacups & saucers at 2 different Goodwill stores and my daughter absolutely loved that she had REAL teacups to use at her party and has used them many times since then too. 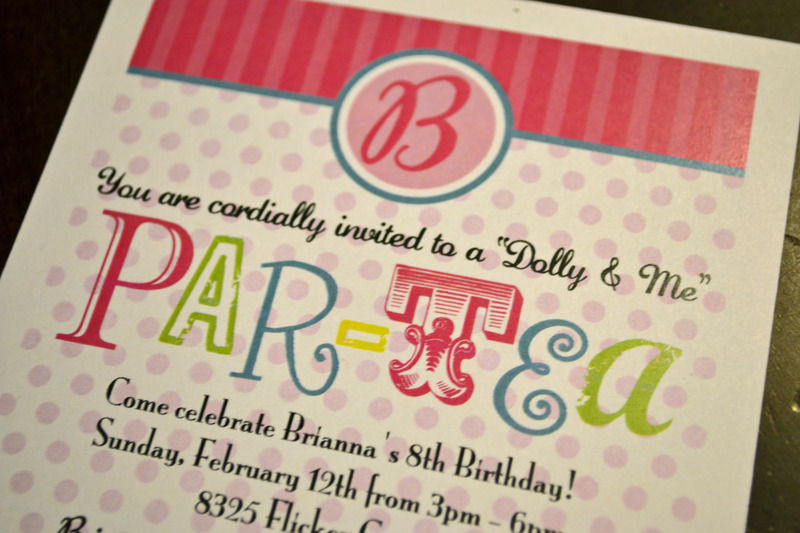 I also found some darling tea party printables from MomAndWife.com which I downloaded and used for the birthday banner. 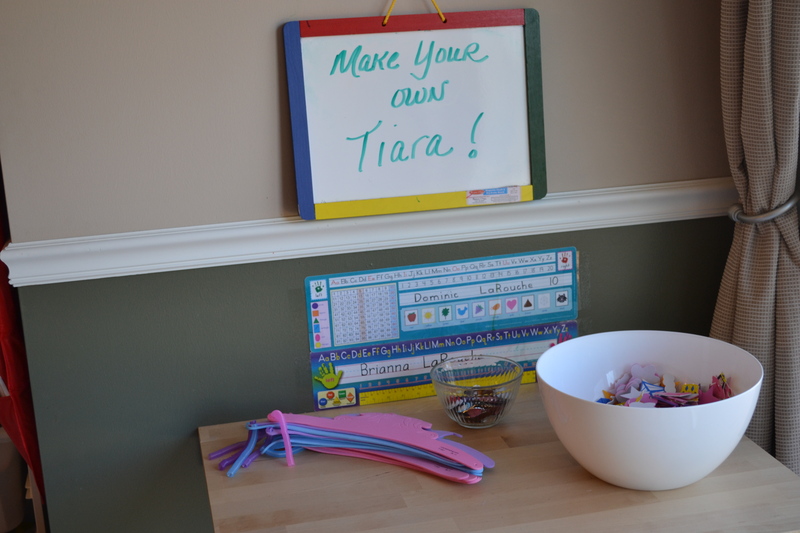 We started off the party with each of the girls making their own tiara using foam tiaras, foam stickers and stick-on “jewels” from OrientalTrading.com. After the girls make their tiaras, we took a group picture which will likely be used in the thank you notes that we will send out. We started “Tea Time” and had shortbread cookie snacks to eat with their tea. The girls all thought it was really cool to be drinking REAL tea and they were so cute doing so. After tea, the girls retreated to our downstairs bedroom where I had pulled out a bunch of old formal dresses and a few more that I picked up from Goodwill that the girls could dress up in for their runway fashion show. I had purchased some boas and necklaces (also from OrientalTrading.com) for them to dress up their outfits and for them to take home as “goodies”. When each girl had gotten two passes down the runway, they all changed back into their own outfits just in time for the overlapping portion of the twins birthday party. After pizza, cake and ice cream, each girl left with her fashion show accessories along with a small bag that included a ring lipgloss, a few tea cup stickers and a cute little teacup charm with a few pieces of candy. The best part of course, was when my daughter stated that this was the best birthday EVER. What more could a mom wish for? One of my favorite things to do is plan my kids’ birthday parties. In another life, I would start a business planning parties. I have so much fun with the details and getting things just perfect and this year was no exception, although it did come with a new challenge for me. My twins are eight years old now and well, their interests are vastly different. In years past, I had gotten away with a joint them—Dora & Deigo (at 2), Blue’s Clues (at 3), Curious George (at 4), WonderPets (at 5). Even at ages 5 & 6 we did a roller skating party and just customized the cake and tableware to make it a little unique for each. This year, however, Miss Brianna wanted a Tea Party. She is very much a “Princess at Heart”. Dominic, on the other hand, is a huge video game fanatic. If I let him, he would play 24/7, I’m convinced of that. Obviously, there was no way to tie these themes together. So, the options were (1) plan 2 separate parties on 2 different days or (2) have overlapping parties. Well, I decided on the latter—quite frankly, as much as I love planning the parties, the actual execution is extremely tiring. I figured it best to get it all over in one day, right? This would make me either the most efficient birthday party planner or the most insane—you decide. 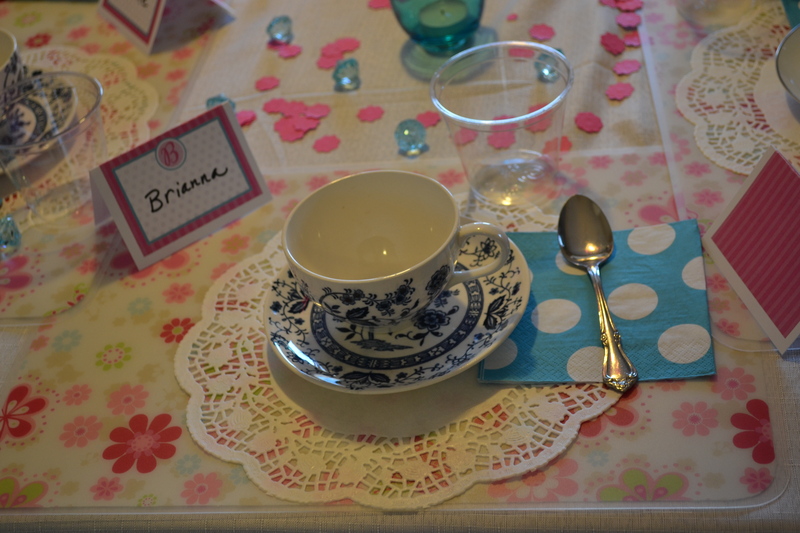 We started the Tea Party at 3pm and I allowed Brianna to invite 8 girls over. I should have said 7, since we only have 8 chairs to fit around our kitchen table (Note to self: remember to add in your own kid!). We would have just girls for 90 minutes and then at 4:30pm the boys would arrive. We would then do pizza, cake and ice cream maybe a few games. At 6pm the girls would leave and then 90 minutes of video games. At 7:30 the boys would leave and I could grab a glass of wine and celebrate “SuperMom” status for the next 24 hours! Overall, I’m pretty pleased with how things turned out. If you’d like to read more about the parties themselves, keep an eye out for a follow up post for each.